You know that rabbit – the one in Alice in Wonderland who runs around shouting “I’m late. I’m late.” That seems to be the story of my life. My Dad was a time freak, although I don’t remember him chasing around frantically like I do. But cross him with his time and he didn’t like it. What did I expect. Dad worked as a timekeeper for the CN (then CNR) for over 45 years. I guess it spilled over into his personal life. He would sit at the kitchen table at dinner time and commiserate with his watch. He’d look up at the wall clock, then back down to his watch and reset it. “Have to take it in to Riry Birks to get it regulated,” he would say. Excerpted from You Can Go Home. Copyright 2009 Sharon Crawford. Once we entered Union Station, Dad hit his stride. Then we are speeding down the corridor ramp connecting the main concourse with the departure waiting area. A long line-up winds around from the second track. Dad straightens up his 5’3” stature, puts a stern look on his face and creates a gap between a mother and her five children, while my mother murmurs an “excuse me,” and I follow like the little lamb, not to slaughter, but to the fold of the railway station. Dad leads us over to Platform 9, to the front of the non-existent line-up, just behind the roped-off gate. I’m right with him when he again looks at his watch. I can’t wait to get on the train. “It’s 9 a.m.; the train doesn’t leave until 10.30 a.m.” Dad nods his head. That seems like a long time to an eight-year old, so I start squirming. Like my father before me I wear a watch and have clocks all over the house. My kitchen contains two clocks, but my office contains four clocks – when the computers are turned on. The two in the kitchen tally for time, although one is digital and the other is an old-fashioned round electric wall clock with hands – just like the one in the kitchen when I was growing up. I prefer the hand type – except when I’m in a hurry and need the exact time NOW. Then it’s digital. The office ones don’t all agree – the wall clock (the one in this photo; Teddy doesn’t sit on it. He hangs from a hook on a shelf, but that’s another story. 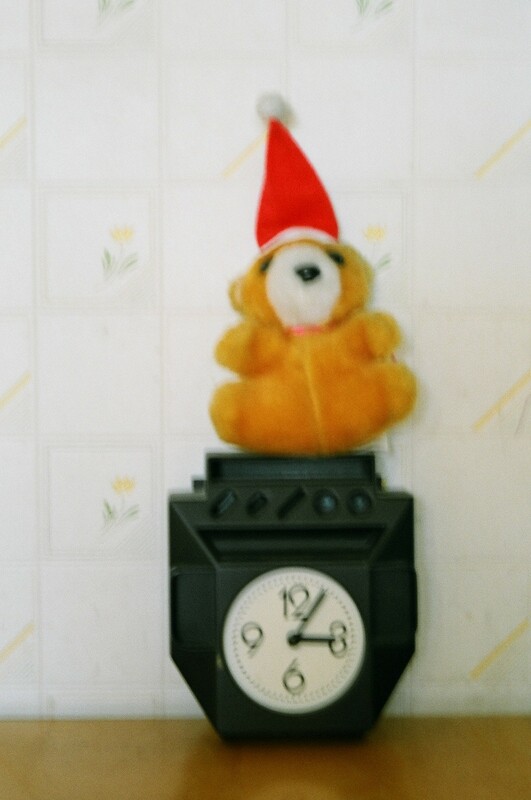 I removed the clock from the wall to shoot the photo) is set five minutes ahead. That’s so I will finish my work on time and get on to the next thing to do or place to go. Doesn’t work – I mean me. The clock is just fine. I pile up place after place for my errands, constantly check store clocks and my watch, trying to beat time, trying to get home by a certain time so I can race around the house doing more chores or watch TV and do chores during the commercials unless it’s PBS or TVO. Lately, er, recently, I’ve come close to having a panic attack – chest tightening and feeling anxious. So before it gets full-blown or worse – catapults me into heart attack territory, I’m trying to rein in my time. Focus on one matter at a time; say “NO” a lot; delete more e-mails and leave some unanswered – at least for awhile; let the phone ring and ring – voice mail can do the job; move some stuff into that big fat and getting fatter compartment called “pending.” I’d add “delegate,” but to whom? Remember, no brother, no sister, and no partner here. However, I could synchronize all my clocks. What do others do to tame time? Any big secrets to doing this? Do “only” characteristics transfer through genes? My son, Martin, also an only child, was telling me recently that he’s not too happy with his current job (he’s an IT person, but his big love is music and playing in a couple of Toronto, Ontario-based bands.) It’s the IT part that he was referring to. A bit of background here. My son and a friend started a small computer consulting/processing/data preparation company when he was 20. It got so busy there were five or six of them working there at one point. He also had to quit his studies at the Ontario College of Art and Design – no time – after two years. Then the dot.com crash occurred in the early 2000’s and the company was rolled up into a larger company. Since then, Martin has gone back and forth from computer software consulting to working for different companies specializing in programming for the financial sector. The longest he’s worked at one company is three years – he was never fired; he just got fed-up with what often turned into 24/7 deployment (this is IT – new software programs go haywire) and sometimes the job functions didn’t and don’t fit exactly what he wants. Then there is the time taken from his music. Mom, here, has a somewhat scatty employment history. I’m not going to list the whole enchilada (boring) but the longest I stayed at one, a legal publishing company, was seven years. To give me credit, I was “let go” for being redundant (my position as proofreader, not me personally, although sometimes I wonder about that as I get older). Since then I’ve added on to a career as a freelance writer (I never stopped even when working full-time) and developed a freelance editing career. And I teach/have taught writing and copy editing. But… and here it comes… I quit teaching copy editing at George Brown College because the lesson and exam preparation, and marking papers and projects left me little time for anything else. My authors were complaining about my s-l-o-w edit of their books. However, I don’t think that’s the only reason I quit. I wasn’t finding any time to write (except comments on students’ projects and exams). And that was driving me crazy. I’m still complaining about not enough time to write and I’m referring to personal essays and that memoir about growing up an only child of elderly parents (see my “About” page). It’s a variation of the do what you need to do to earn a living and do what you love. Except I’ve found a somewhat happy medium – I like to write magazine and newspaper articles, edit authors’ books, and teach – I love to teach writing and editing – preferably distance learning, in-person workshops or through my East End Writers’ critique group. I do that and try to squeeze in writing the memoir. So, back to the beginning here: is my son’s scatty IT career due to something in his only child genes? In other words is “mom” to blame? My preliminary research (and I’m still looking) doesn’t hit exactly on this specific. Therefore, I’m going to combine the scientific with the personal. First, the scientific: In a quantitative review of previous studies on only children published in Journal of Marriage and the Family (1987) , authors/researchers D.F. Polit and T. Falbo state that only children score high in achievement and verbal ability. In the book Maybe One (1998, Simon & Schuster), author Bill McKibben states that only children are better at making new friends outside the family and dealing with new situations. For more information on this, check out the Wikipedia listing on “Only Child.” Especially interesting is the reference list. And more interesting is McKibben and his wife’s choice to have only one child and why. I’m still reading his book. More information on McKibben is available at his website http://www.billmckibben.com/. He is also quite the environmentalist. Next book on the list to read is Only-child experience and adulthood by Bernice Sorensen (2008, Palgrave Macmillan). Second, the personal: My employment history as stated above. But, and it is a very big but, where did I get it? Both my parents had many siblings (dad, four and mom, seven). Mom and dad also didn’t get bored and switch jobs a lot – well, maybe they got bored. Dad worked for CN Railways from 1918 to his retirement in 1964 and mom worked for the same insurance company until sometime after she got married. She even went back years later to work for an insurance company – not the same one, but a firm where a Vice President was a former colleague. She left because of a medical condition. So the gene transfer theory may not be 100 percent here. I suspect with both my son and I, boredom and job dissatisfaction play a part. And don’t we all want to do what we love most? I think environment has a lot to do with it and I don’t just mean family environment. There is the environment out there in society. Unlike in my Dad’s time, we no longer all hang onto the same job until we retire. Then there is the emphasis on the individual doing what he or she wants. I know, I know, that started with my generation – but that’s environment, not genes. I’m still exploring this issue. What do others think? Am I woolgathering or?